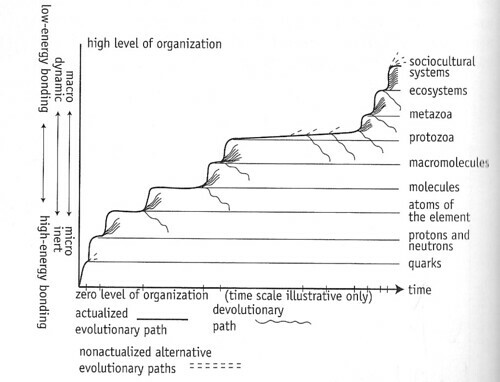 One of the paradigms in complex adaptive systems thinking that has great explanatory power is the idea that there are distinct systems organized hierarchically in various levels of complexity. So, for instance, you can look at atoms as being a system at one level of organization, on top of which sits the next level of atomically bonded compounds (aka molecules), on top of which sits the next level of molecular reactions (e.g. chains of enzyme reactions), and so on. It’s well-understood that within a given level, the individual elements (i.e. atoms at the atomic level, molecules at the molecular level, etc.) interact with one another and can be thought of as passing messages or sharing information. At the atomic level the interactions (mainly) come in the form of atomic bonds: two hydrogen atoms bind to an oxygen atom in a particular configuration in a standard and repeatable way. Incidentally — from the standpoint of the atom — we come to recognize this pattern and classify such a configuration as a water molecule. Incidentally — from the standpoint of the molecule — we recognize that water molecules can configure in several ways to form what we call ice, water, and steam/gas. It’s hard for us to think of atoms and molecules as message passing or information sharing, but at higher levels of complexity (e.g. the brain, humans with language, even enzyme chains) we instinctively recognize that information is created, destroyed, blocked, and used in many different ways. Importantly, information within a given level can be passed in chains from one element to another, and from there form feedback loops in which the end of the chain connects back to the beginning of the chain. From The Chaos Point. Reproduced with permission from the author. The theme of levels will come up over and over again and refined. Here are some concepts, none of which are truly unique, but often we forget to take them together and follow them to logical conclusions. This too is just a model. The formation of higher-level “suprasystems” through the interlinking of previously relatively autonomous systems (which are thereafter subsystems) is a familiar notion in systems theory. Suprasystems emerge through the creation of “hypercycles” in which the subsystems are linked by cycles that mutually catalyze each other: so-called cross-catalytic cycles. The result is that the subsystems become increasingly interdependent, while the suprasystem jointly constituted by them takes on structure and autonomy. A didactic concept is that of “agency”, namely that we should think of the subsystems (atom, molecule, cell, person, whatever) at any level of organizations as agents which: (a) interact with one another (i.e. pass messages), and (b) have a strong self-interest in preservation. Often times that preservation comes in the trivial method of continuing to exist in its current form (as opposed to say, breaking apart or disappearing). Other times, and especially at the organic levels and above, preservation happens through a Darwinian process of “descent with possible modification”; namely we can look at the child (or clone in the case of clonal cells) as a form of preservation (with only slight modification). The organizational structure and dynamics at the higher level constrains the interactions of the elements/agents at the lower level. For instance, when multicellular organisms emerged and started becoming selected for, their cellular constituents stopped evolving (in the Darwinian sense) for all intents and purposes. * Darwinian evolution is just one type of interaction that can occur within a level, so it is not inconsistent to say that lot of interaction happens between cells within a multicellular organism (hormonal, neuronal, etc). We must keep in mind that the higher level may itself change over time, in which case the type and amount of constraint applied to the lower level may change accordingly. Agents emerge with the ability to communicate with one another, even if that communication seems trivial, such as the gravitational force one mass applies to another. The types and amounts of intra-level communication varies quite drastically from one level to another. From the collective interactions of agents — which is constrained by the higher level — various properties emerge that we recognize only at the higher level. For instance, water molecules interact differently with one another depending on temperature and pressure constraints (among others). At the higher level, we recognize the properties of hardness, wetness, volume, etc. which are emergent properties not present at the level of the water molecules themselves. ** In the end, things we take for granted as being solid concepts are really emergent properties: “price” of a stock, “memory” in the brain, “government”, “kidney”, “epidemic”, “computer”, “cancer”, ” “atom”, “time”, “truth”. Additionally, the concept of level is just a model. It is a useful construct to remind us that the type of information that flows between systems at different levels — namely constraints and emergence — is of a different sort than the intra-level information that flows at either of the levels themselves. In other words, we can’t understand what’s going on in System B by looking at System C alone (the reductionist paradigm), System A alone, or even System B alone. Often times we confuse properties of System A (e.g. hardness of ice) as being properties of System B (i.e. the water molecules and their interactions), but they are really properties of the agents of System A rather than anything meaningful within System B. * This is not strictly true, however selective pressures at the higher levels have both reduced selective pressures at the cellular level and put shackles on the evolutionary process via mechanisms such as apoptosis (programmed cell death). The “evolutionary” view of cancer says that cancer is evolution at the cellular level. While I agree with this view, I don’t think it’s the whole picture, and some important consequences are often brushed under the table or not considered. ** Notice that temperature and pressure are also emergent properties and are no more special than other properties like hardness or wetness; we just know techniques for manipulating those properties more directly than others. Society of Mind by Marvin Minsky: A series of short essays on how intelligence can emerge from collections of interacting agents. Cambrian Intelligence by Rodney Brooks: An easy to read accounting of Brooks’s subsumption architecture (where higher levels of behavior inhibit lower levels) and the results he and his students achieved with it. My graduate advisor developed the Spacial Semantic Heirarchy. This is another heirarchical structural design that is biased for spatial navigation. Stimulating and thought provoking content. Thanks for organizing this site for persons interested in complex adaptive systems.